Scott Santos, the village of Ashley’s new police chief, said he takes a holistic approach to law enforcement in the small community. He was officially appointed chief on March 5. 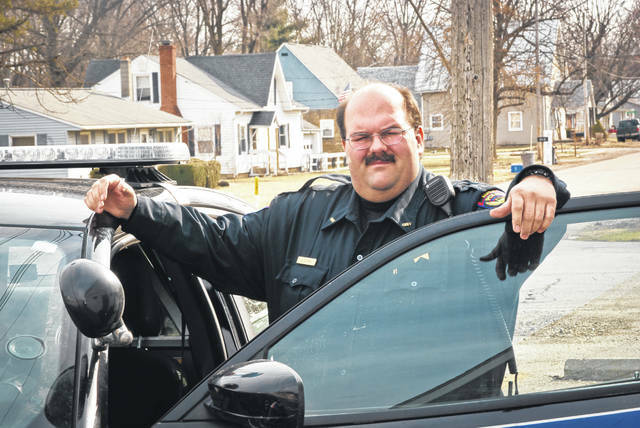 “I’m local through and through,” said the village of Ashley’s new Police Chief Scott Santos, who was appointed to the position March 5. Since the first of the year, Santos has been filling in as the acting police chief after Doug Patrick decided to retire from the position at the end of 2018. 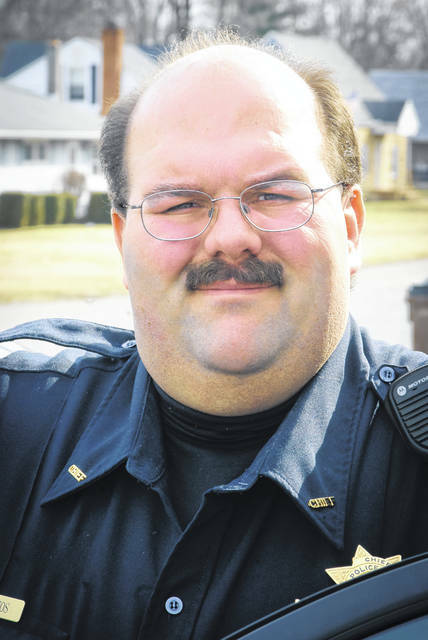 According to village officials, Patrick started as a part-time officer on the village force in 1992. Two years later in 1994, he was hired full-time. Patrick’s tenure as police chief began in 1998. Santos said his law enforcement career started as a part-time officer with the police department, much like Patrick. Within ODNR, Santos worked as a park and staff officer. Santos said he received a commission at 22 years of age with most of his professional career being in law enforcement. A native of Delaware, Santos was born at Grady Hospital, graduated from Delaware Hayes High School, and still lives in Delaware today. He said the drive from Delaware to Ashley every day allows him a chance to focus on the day ahead and a chance to de-stress on the drive back home at the end of his day. However, before moving into law enforcement, Santos had other plans after high school. In 1997, Santos said he left OWU as a student to work in private security, and he later returned to OWU to work as a public safety officer. It was at that point Santos entered the police academy at the Delaware Area Career Center. Santos said while Ashley is a pretty quiet community, there are things that happen there just as they do in any town, just not as often. Santos said he had a parent ask him to talk to their child about getting up for school in the morning, but on the other side, he said they make traffic stops and deal with felony warrants as well. Santos said his department still makes arrest along with all the dangers that come with a traditional law enforcement position, but since Ashley is a small community, everybody knows the officers. He said the people wave when they drive by and many still call him by his first name instead of his title. However, Santos said that all changes if someone is pulled over for a traffic violation. Santos said he takes a holistic approach to law enforcement in Ashley. This entry was tagged D. Anthony Botkin, Doug Patrick, Jim Nelson, Mayor, Police Chief, Scott Santos, Village of Ashley. Bookmark the permalink.